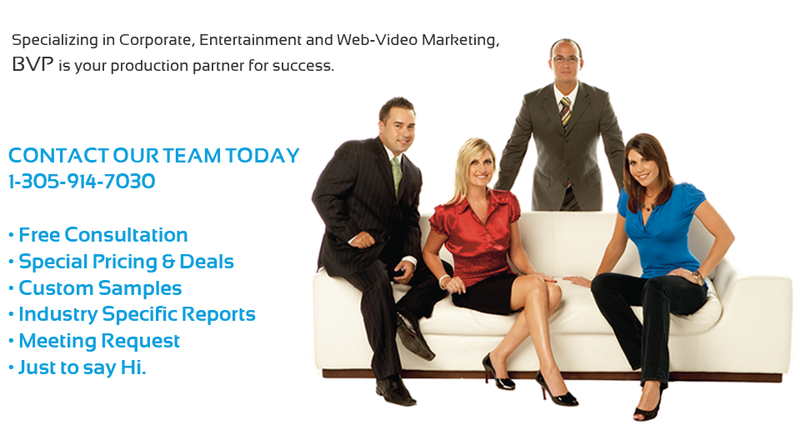 Get Video Production Services from South Florida's Premier Video Production Company. Get your free e-guide today. 10 ways to Save Time & Money by choosing the right video production company. Beanovision is South Florida's #1 full video production company based in Miami FL for over 10 years. We specialize in video production services including Corporate Video Production, Business Video Production, YouTube Video Production, TV Commercials, Real Estate Video Tours, Event Coverage, and more. The world is always changing and attention spans are getting shorter. Video marketing is a proven way to engage with your potential customers and audience in a way that entertains and educates. This happens through various video channels such as TV, Online & Web Video, Trade Show Booths, Digital Signage, and Live Events just to name a few. No matter what industry you are in, video can help your business grow. Choose a Miami video production company that you can trust with years of experience in working with small and large clients locally and nationwide including Nikki Beach, Warren Henry Auto Group, GE, Hertz, and Trump International. With Beanovision, sacrificing quality is never an option. We guarantee you will always get the highest quality video ready for today's standards either for TV Broadcast or Online Web Marketing. Contact us today for a free no-obligation consultation so we can discuss with you how it works, video production costs, and how we can help you maximize your video marketing dollars for the best results. Why you can't afford not to have video!? No print, radio, or billboard ad can get your message across easier and more effectively than web movies. This instills a tremendous sense of confidence & shows why you are the best. It can take pages of text to do what video can accomplish in seconds! Why do you think companies spend billions of dollars showing us their products on TV? Because experts know it works! Look at the Home Shopping Network. Now you can use the same proven media - VIDEO - to capture the attention of visitors to your website - it's almost fool-proof! NEW TECHNOLOGY GIVES YOU THE "TV QUALITY YOU NEED"
New Flash technology which spans both the PC and MAC world means 98% of all the people online will seamlessly see your video. The new Flash browser plug-in is free and installs in seconds with a few clicks.